Pysanky is kept vital by constantly expanding its definition, while preserving its traditions. EARLIEST WRITING TOOLS Peasants often made a crude wooden tool with a pig-bristle fixed to the end. In earliest times, it would have been a thorn. Today pysanky writers use a copper, metal or electric" kistka". What is a kistka? 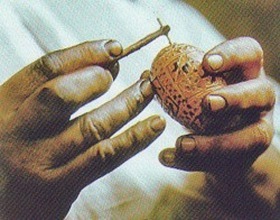 A kistka or kystka is the name given to the stylus (tool) used in making pysanky in some areas of western Ukraine and in Poland. It is also referred to as a pysachok and pysaltse. It generally consists of a small metal reservoir with a fine tip/opening on a wooden or plastic handle. Wax is scooped into the reservoir, heated, and then this stylus is used to write with wax on an egg's shell. 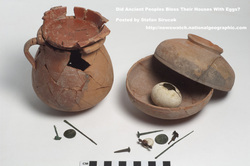 Cultic ceramic eggs have been discovered in excavations near the village of Luka Vrublivets'ka, during excavations of a Trypillian site (5th to 3rd millennium BC). These eggs were ornamented, and in the form of торохкальці (torokhkal'tsi; rattles containing a small stone with which to scare evil spirits away). This is the oldest Easter egg found by Lviv archaeologists to date. 500-year-old Easter egg was found during excavations in Lviv, the press service of the Rescue Archaeological Service of the Institute of Archaeology of the National Academy of Sciences of Ukraine has reported.According to the report, the pysanka (a Ukrainian ornate Easter egg) was found in a water collector dated to the 15th-16th centuries, on Shevska Street in the central part of the city at a depth of 5.5 meters. "Previously, Kyivan Rus pysankas dated to the 12th-13th centuries were found in Zhydachiv, Lviv region, and Khrinnyky in Volyn region, but these were ceramic eggs. This one is made on an egg shell, most likely from a goose egg. And it is very well preserved, almost 90%," a junior research officer of the Rescue Archaeological Service, Ostap Lazurko, said.